Barcelona are primed to make a £30 million offer for Chelsea's Brazilian defender David Luiz. 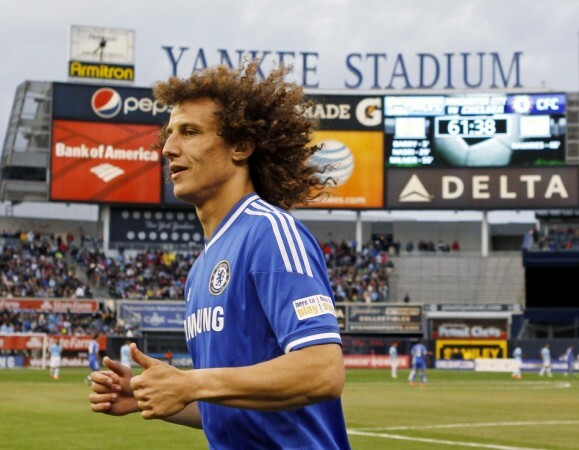 Barcelona are primed to make a £30 million offer for Chelsea's Brazilian defender David Luiz. According to the Daily Mail, the Catalan club has turned to Luiz in an attempt to bolster their defensive ranks ahead of the coming season. During the last campaign, when Carlos Puyol and Javier Mascherano were out after sustaining injuries, Barcelona coach Tito Vilanova was forced to play inexperienced 22 year-old center-back Marc Bartra. The lack of depth in defensive areas was highlighted by Bartra having to take the field against Bayern Munich in the semi finals of the Champions League. It appears as though the club has turned to Luiz in their attempts to bring in a recognised center-back. Furthermore, at 35, Puyol is entering the last few years of his career. Twenty-six year-old Luiz, on the other hand, would provide the club with a long-term replacement for their captain. Luiz is one of the few center-backs suited to Barcelona's game having exemplary distribution skills. Chelsea, however, will not likely allow one of their most promising players to leave at an age when he is beginning to mature as a player. Luiz was instrumental in Brazil's Confederations Cup triumph last month and cemented his place in the Chelsea team under Rafael Benitez last season. The interest of Barcelona is a testament to how impressive his performances have been in the past year. Chelsea manager Jose Mourinho is yet to comment on the Luiz situation. However, he stated his expectations from younger players at the club to take up the mantle from older experienced players such as John Terry and Frank Lampard. "This is the legacy of the club culture - as some guys are arriving they have others who can transmit to them immediately what this club means," Mourinho told The Sun. "One day, these older players will finish and the younger guys now will be the older ones in the future, so the Chelsea culture is continuously passed on from one generation to the next."